One of the most distinguishing symbols of fall for me are leaves and their changing colors during this time of year. 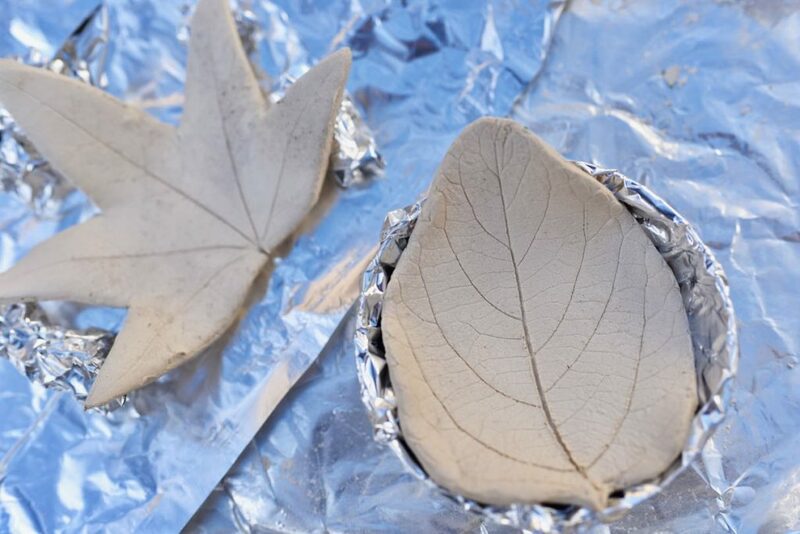 I wanted to create some pretty clay leaf bowls that could serve as small bowls for holding keys or jewelry, could be used as decorations, and could even be turned into candle holders to add a nice warm glow to those cool fall nights. These clay leaf bowls were actually much simpler, and turned out better, than I even imagined! 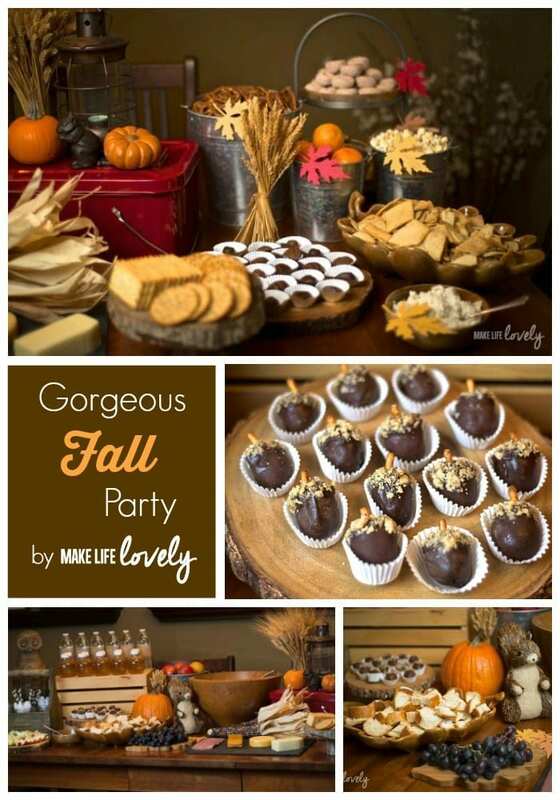 This is a great fall craft for kids and adults alike. The hardest part is waiting patiently for the clay leaves to dry so you can paint and personalize them. I chose to paint my diy clay leaf bowls in beautiful metallics, but deep reds, oranges, and yellows would be nice too. 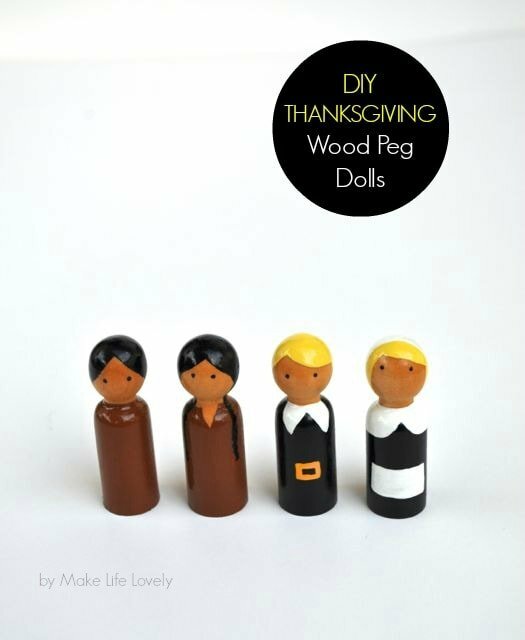 My friends at Oriental Trading Company sent me some air dry clay and mini rolling pins for this craft that worked perfectly. The mini rolling pins were just the right size for the leaves, and perfect for smaller hands if you have kids creating with you. 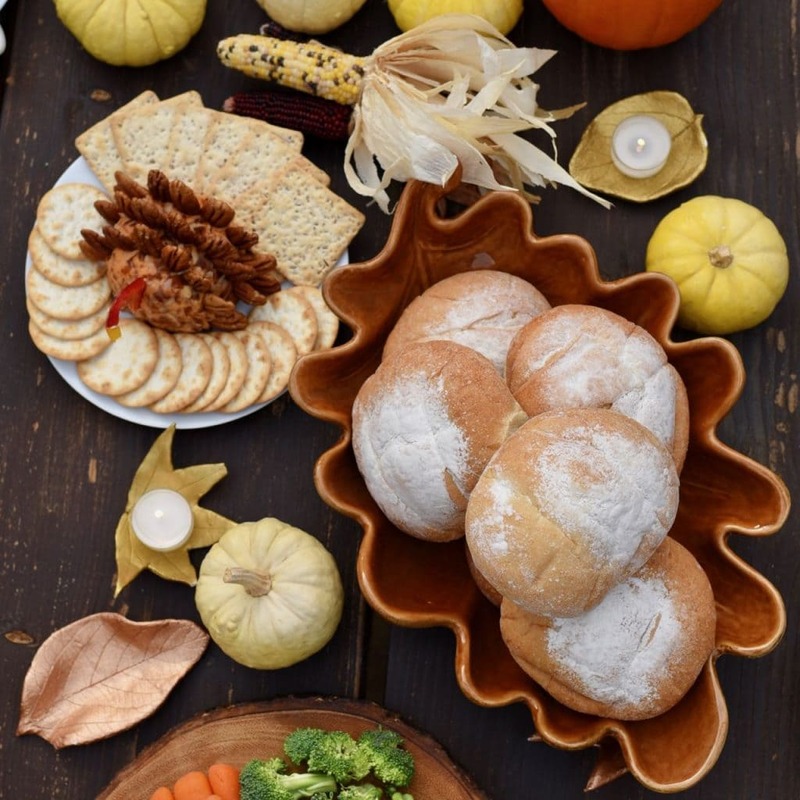 They have lots of Thanksgiving supplies and supplies for all the holidays and celebrations! If you’d like to order from Oriental Trading, we’ll both get $10 off plus free shipping on $49 when you click on my referral link. Score! STEP 1. 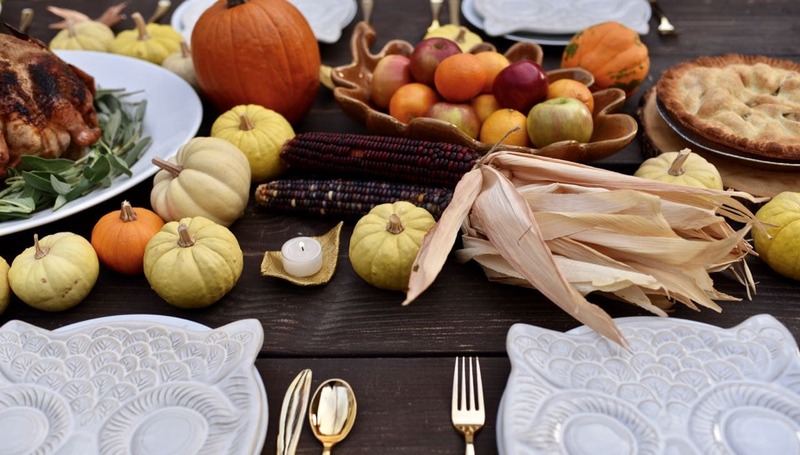 Find some large leaves that aren’t torn that are fresh. I found that dry leaves don’t leave as good of an impression in the clay. You can make this fun by going to the park and finding a collection of your favorite leaves, or even searching the trees in your own yard like I did. If you’re doing this with kids, you can also turn it into a fun science lesson by identifying which trees have which kind of leaves, why the leaves change colors in the fall, etc. STEP 2. 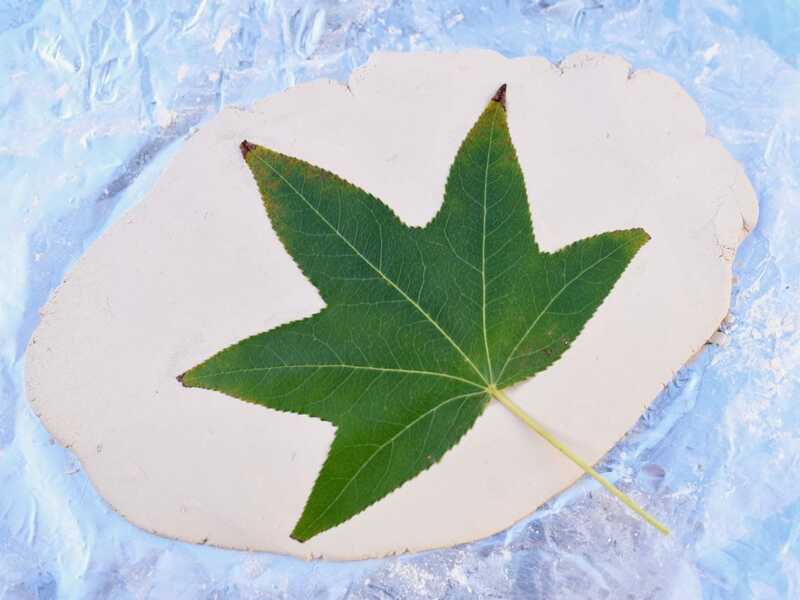 Take a medium-size piece of clay and roll it out a bit thicker than you would like your finished leaf to be. 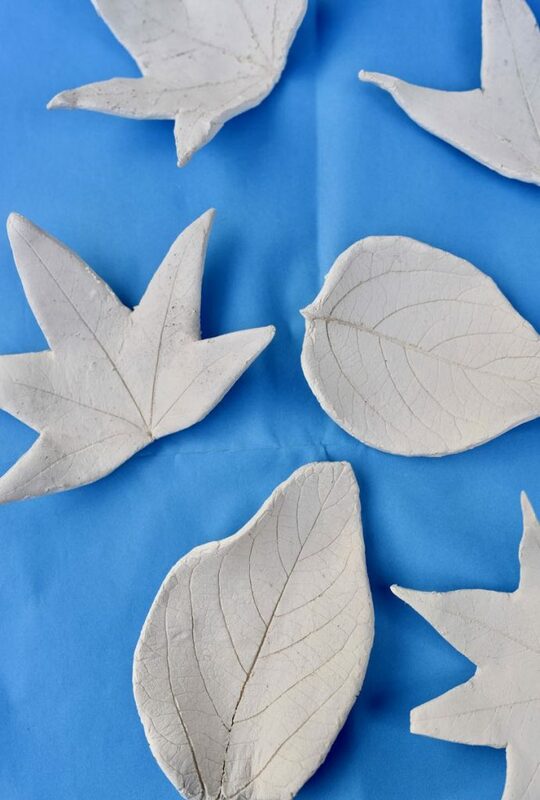 Place your leaf onto the clay, then use your fingers to gently press the leaf into the clay. 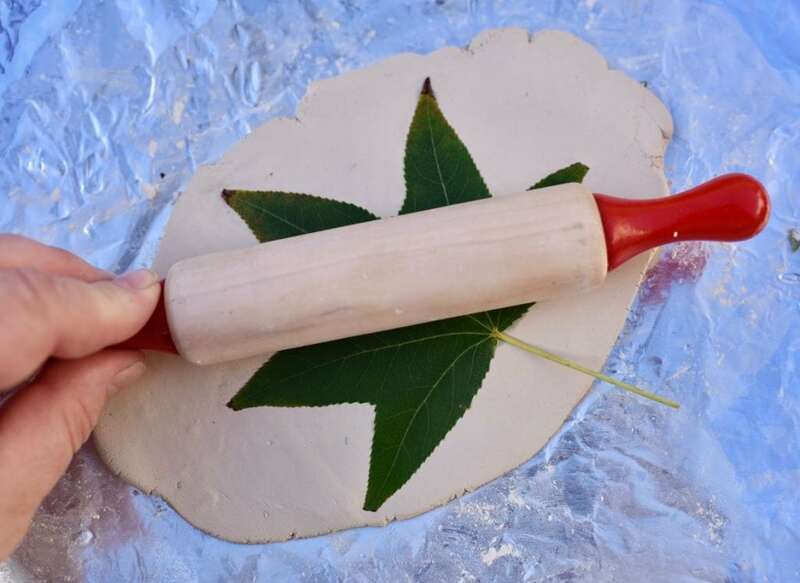 Use the rolling pin to roll over the leaf to leave an imprint in the clay. 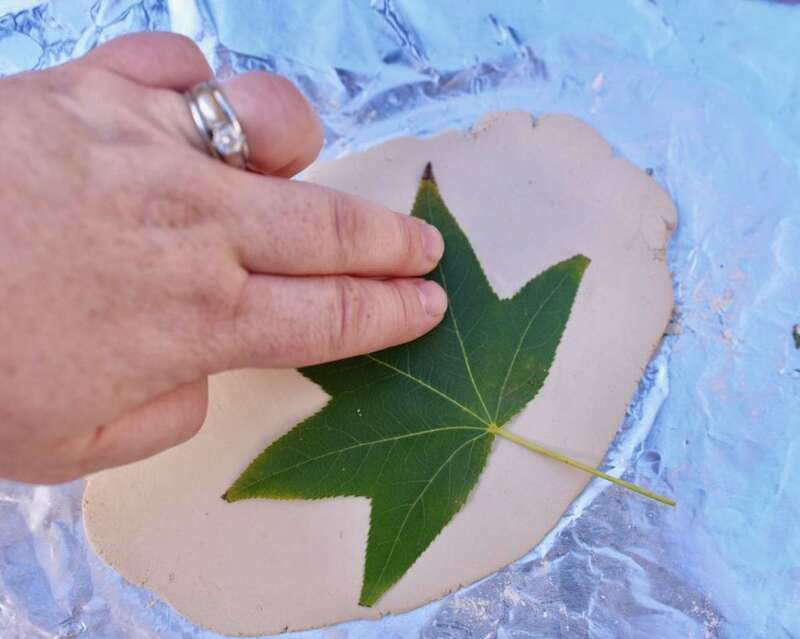 Pick up the clay and use a small pair of scissors to cut around the edge of the leaf. Very carefully remove the leaf, starting with the stem. Look at all the veins and amazing detail that is on your clay leaf now. Isn’t it gorgeous? If for some reason you make a mistake, just roll our your dough and start over again. No big deal! STEP 3. 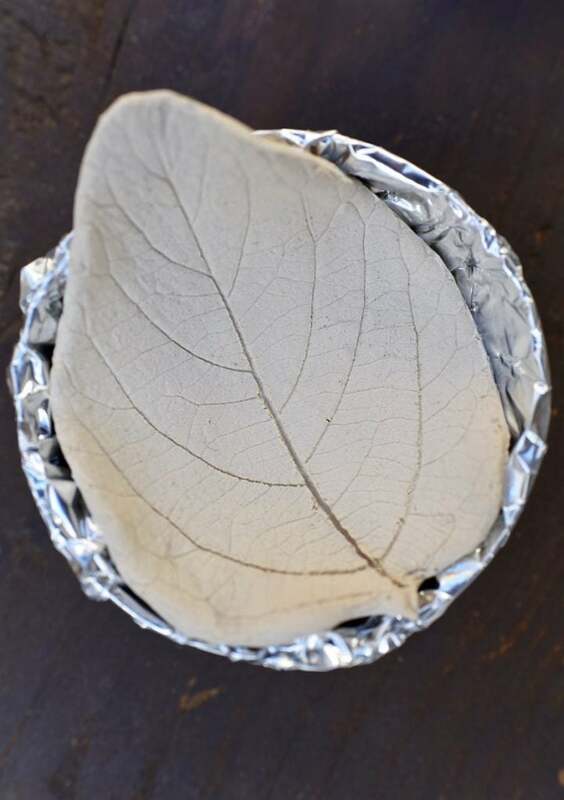 Place the clay leaf in a foil-covered small bowl. Curl up the sides of the leaves along the edges of the bowl so the leaves are rounded like a bowl or to hold tealight candles. Let dry for a day or two until completely hard and dry. STEP 4. Once your leaves are dry, it’s time to paint. 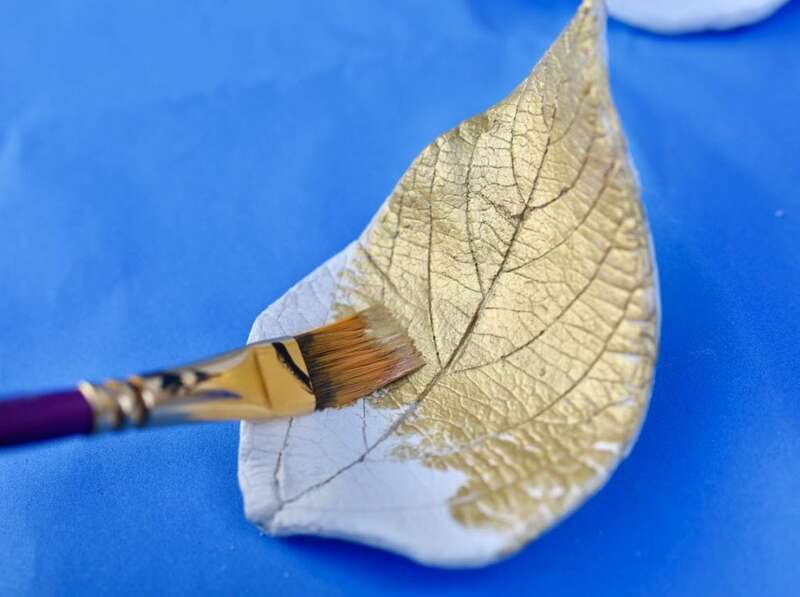 I used metallic gold and bronze paints on my leaves. Let dry. Now it’s time to display your beautiful clay leaf bowls! 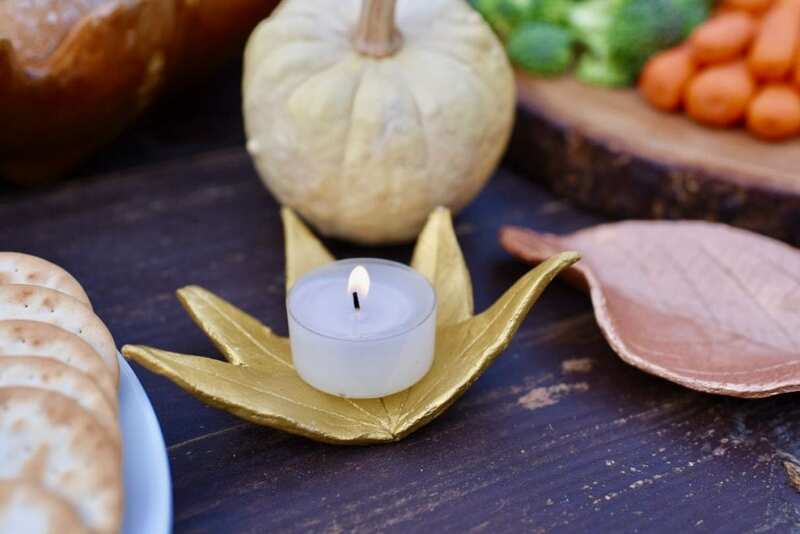 As I mentioned before, you can use them to hold small household items, place them around the house as decorations, or place small tealight candles on them and use them as clay leaf candle holders. 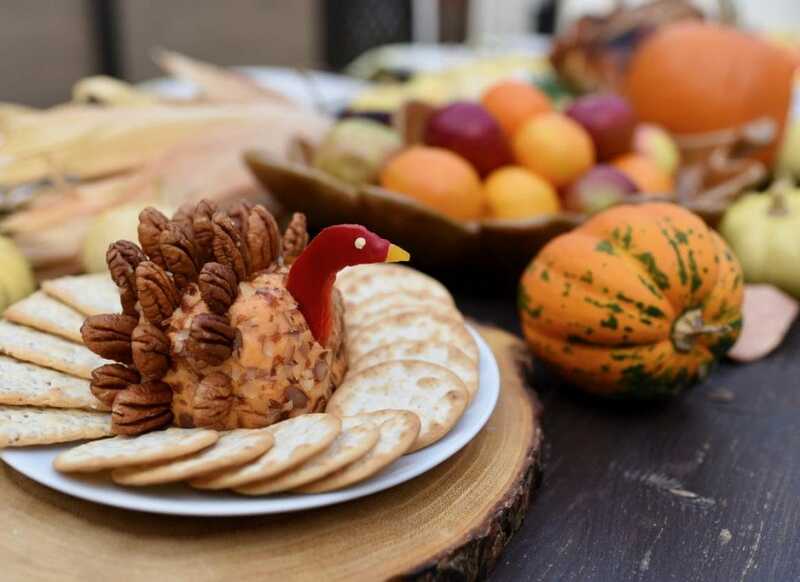 I used them for our Thanksgiving table as candle holders when I shared my delicious turkey cheese ball recipe. 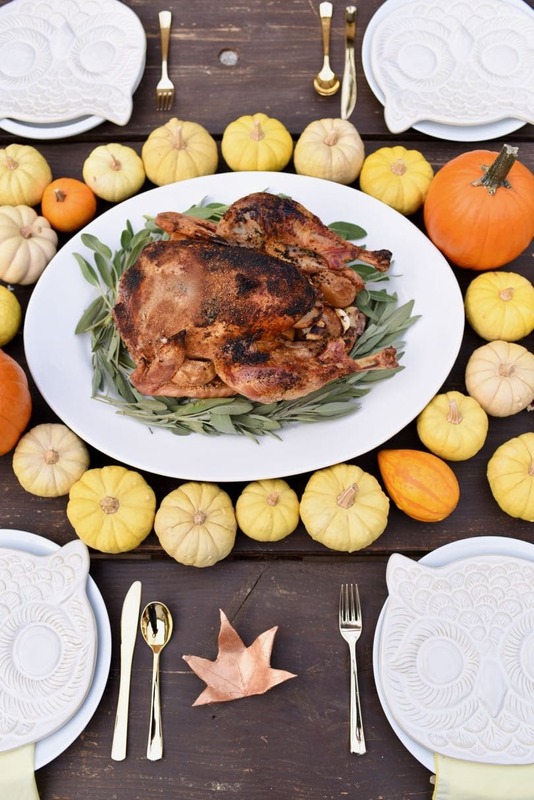 It’s the perfect easy Thankgiving appetizer and looks great on the table! 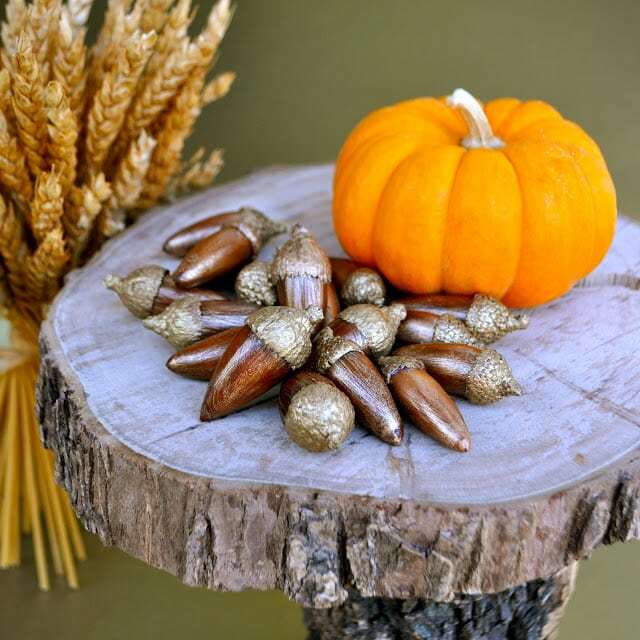 I also scattered a few around the table for lovely fall decorations. I think the bronze ones are my favorites! 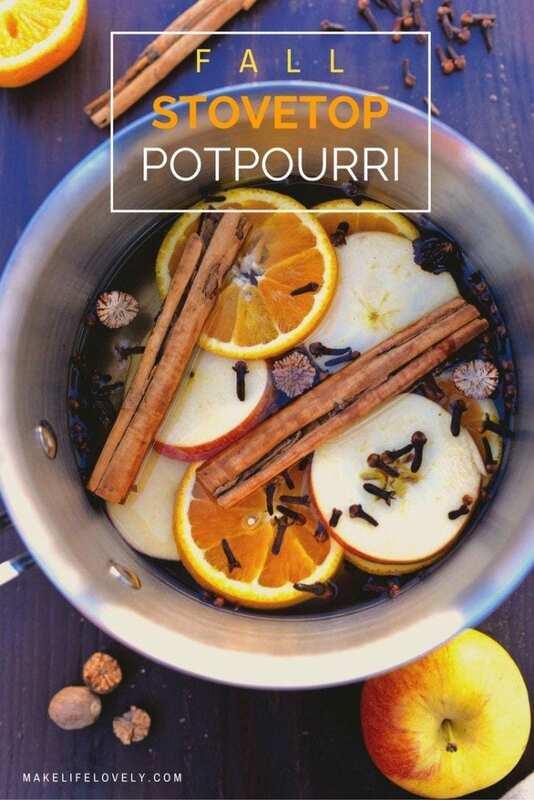 Any way you use them, they are a great way to enjoy the beauty of fall and nature year round.